A cross-section of Cookstown’s community will board a bus for Stormont next Monday on a mission to #DeliverDesertcreat’. Organised by Cookstown District Council the delegation will hand in letters of concern over the stalled training college, which was first announced 11 years ago. First Minister Peter Robinson, Deputy First Minister Martin McGuinness, Minister for Justice David Ford and Minister of Finance and Personnel Simon Hamilton have all been invited to accept the letters, which will impress upon Ministers the importance to the social and economic prosperity of the region that the project represents and the concerns of local businesses in particular at the ongoing delays in delivering the project. 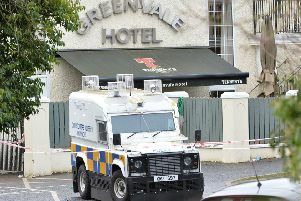 Clearly frustrated by the lack of action, Cookstown council’s chief executive Adrian McCreesh said:“Justice Minister Ford has previously offered assurance that Desertcreat remained the number one location option...however, he recently outlined that a two stage review process was taking place. The Council is also encouraging political leaders, local ratepayers, businesses and community groups to get behind a social media campaign using the hashtag #DeliverDesertcreat.